Two down, and one more to go! Let me explain... 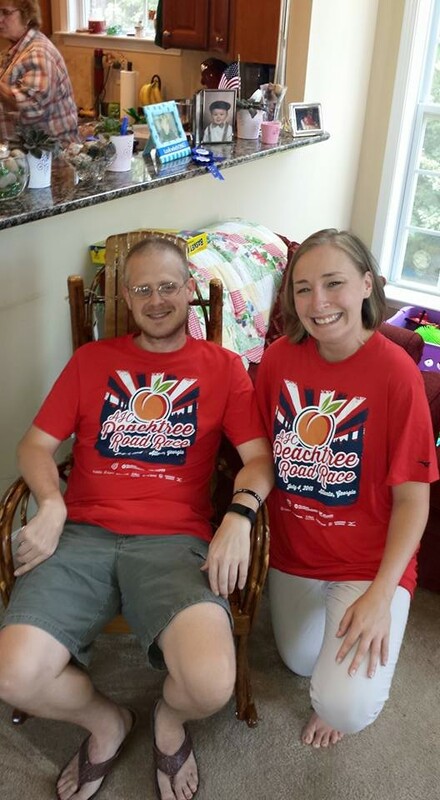 If you have been reading my blog this past year, you know that one of my new year's resolutions is to run three 10Ks in 2015, and I'm happy to report I completed my second 10K on the fourth of July! 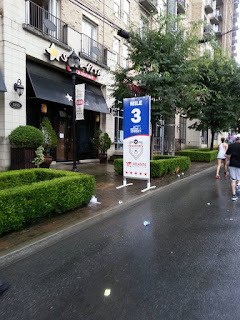 The Peachtree Road Race is a fourth of July tradition in Atlanta, Georgia. I have run it only once before. It was my first 10K back in 2013. Now, you might be wondering why I didn't run it in 2014? Well, I wrote about that in the race report of that run. Suffice it to say, the course is NOT an easy one. 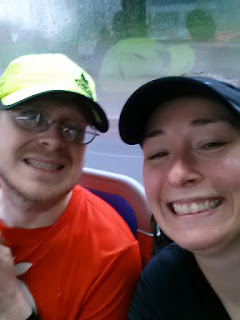 AND after running 6.2 miles for the first time, I realized why I love 3.1 miles (5Ks) more (you have to go back and read that post), so I let my husband run The Peachtree with a friend in 2014 while I stayed home with the kids. But as I said before, when thinking of new year's resolutions for this year, I just felt compelled to run a few 10Ks in 2015. So, it just made sense that I would tackle The Peachtree once more - one of the largest 10Ks in the world. Besides, I felt as is the first time I ran it, the course conquered me instead of me conquering it, so I wanted to run it and have no regrets this time around! However, training in June for this 10K proved almost impossible. I think I got in a total of three or four short 30 minute runs inside the YMCA the month before this race. Why? Life happened! First, post-planning (I'm a teacher) was longer because of added make-up days due to snow back in February. Then, I got caught up in planning for VBS, and then there was VBS. After that, I left on vacation to Indiana for my second cousin's wedding where the cold I got before that vacation worsened, so when we got back from vacation, I was on antibiotics and self-imposed rest to overcome that illness. 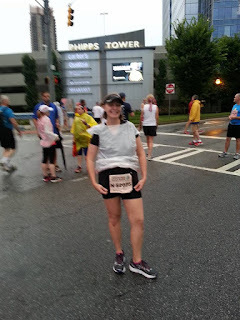 And before I knew it, The Peachtree was the next week! I knew this run would be rough, so I just resolved to run it. No expectations to meet or beat past 10K times. 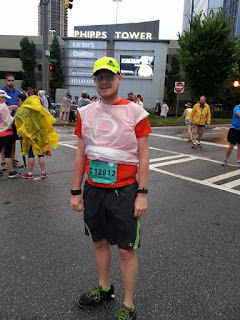 I just wanted to run, pace myself, enjoy this unique event that is The Peachtree, and finish strong! It doesn't look stormy in those pictures because it had rained somewhat before we took them, but then the heavens really opened up once the race started! So much so that the race (which was first ran in 1971) experienced its first ever race delay due to lightning! 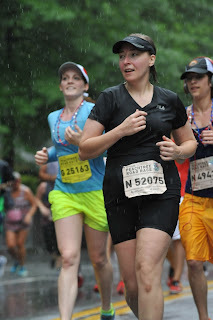 Fortunately, I had already started running when they began to try to stop the race due to the weather. I probably should have stopped when I saw the lightning, but I had already started running. And just an FYI, you can't stop a runner after a race has started - especially if it is a chip timed race. There was no way I was stopping! Granted, my only goals for this race were to pace myself and enjoy the event, but I still wanted to see what my race time would be having approached the run in that manner. So, I kept running even though they tried to usher runners off to the side of the road to find shelter. And it was all good. No more lightning. Thank the good Lord! Pouring rain, but I totally enjoyed it! This is where the famed "cardiac hill" begins. After you finish mile three and see its marker, things start to go uphill. You see, the first half of The Peachtree is downhill - for the most part - and then you start mile four. You hit what is known as "cardiac hill," but after that, the course is filled with even more uphill battles. It's tough! I must confess, after seeing the sign for the completed mile three, I walked a good bit of mile four. I don't do hills well, and I knew if I let mile four wear me out, miles five and six would be disastrous. My race time this year for the 10K was 1:23. The first time I did the course back in 2013, my time was 1:20, so I was three minutes slower this year. Part of that may be due to the fact that the start of the race wasn't really an "official" start. People just began walking slowly forward and over the start line only to find out later that the race had been delayed, so it was hard to actually start running when I was supposed to start running. But, I'm making excuses really. The truth is that numbers never tell the whole story - runners know this. Even though my time was a bit slower, I felt so much better about my run this year than I did the previous time I ran this course. I feel as if this time I conquered this course! It was a good run, and I have no regrets about it! If you ever run The Peachtree Road Race, know that it is a very physical course - even after the run! Once you cross the finish line, you still have to walk about two miles (or so it seemed to me) to get to the bus that will take you to the train that will take you to where you parked your car. We were very tired after the race, and the next day, I was very sore! Contributing to the soreness was the fact that I had accidentally stepped in a pot hole during the race and almost twisted my ankle. I know it looked pretty bad when I did it because the crowd gasped when they saw me stumble, but I was able to maintain my ground and keep running. I didn't feel any pain at the time, but the next couple of days after the race, my right foot was very sore! I've never had a race injury, so this kinda scared me. But I'm happy to report, the soreness went away, and I am able to maintain my running schedule for July - which is pretty full. So, get ready for more race reports headed your way! It's all about that shirt, bout that shirt. Yeah, baby!